"This is a little book that I printed back to back and bound on the side. 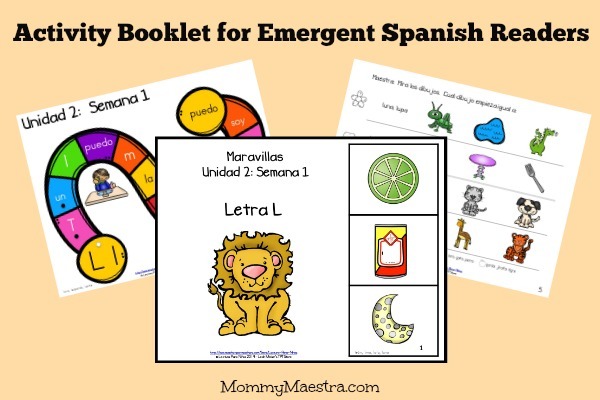 I have created two at this time, but hopefully by the time your readers download this there will be others that will continue to assist beginning Spanish readers. These little books are sequential and correlate with the Maravillas reading series. Eventually I will backtrack and start from the very beginning of this reading series to have a complete set of readers for my students. Since I have started using these with my students, the kids have really picked up on reading their letter names, sounds, and sight words. 1) First I read a line for the students, modeling what the expectation is. 3) Last, I allow the students to read the lines on their own. At the beginning/middle of the week we do mostly I do, we do. Towards the end of the week I do mostly we do, you do. I cannot tell you how much this direct instruction reader has helped my students with the concepts they need to know! I hope your readers enjoy! Here is the TPT link of where you can find more readers like this one for future reference. There will be books added weekly with more sight words added. I will post all books at 50% OFF for the first week added. Here is my FB page where I will announce the new book that is out!"